Karma is a funny thing..I don’t fully understand it, yet I do believe that there are people, moments, lessons in our lives that we are supposed to notice and recognize for their inexplicable fantastic-ness (yup, new word). I’ve always had that feeling..that if I didn’t notice the wonder, I would drown in the sorrow; if I didn’t take the opportunity to be kind, my heart would be assaulted with a severe case of the uglies. To fully disclose – I am far, far, fa-a-a-r from any ideal – I’m as cranky as the next person, miss my share of wiggle-giggle moments, forget that the world is not as circumspect as my thoughts often are. I should do more than I do and think about doing it less. I take too many things personally and need to remember that just maybe, someone is going through his/her own turmoil and I’m not even a blip on their emotional radar. I hate the phone and as such don’t talk with my sister, my family-in-law, or friends often enough. The list could continue, but this post would be too long. I do try though to pay attention. I fretted mightily about the brand new bunny that fell into the pool yesterday. I scooped him out gently and anxiously waited for him to move. It took more than an hour – me slowly approaching him to make sure he was breathing; putting down a towel (why the heck I did that, I have no idea – did I think he was going to towel himself off?) and a baby carrot (after all he was a baby bunny, I figured an adult carrot would be too much); watching him through the window and wondering what the purpose would be if this harmless little thing died because he wasn’t watching where he was going. Slowly he began to do more than just shiver, he cleaned himself off, huddled against the summer wind and considered his options. When Andy came home he went down with the intent to carry him into the taller grasses – I really wanted to get him away from the pool! Without any prodding, the little guy (or gal) hopped away – leaving both the carrot and the towel. And while this little drama was unfolding, there were my friends sending Facebook messages checking on the bunny’s well being, my son calling Andy to tell him that ‘mom is in crisis – hurt animal alert’, all this good ‘juju’ conspiring in the background to write a happy ending for this story. Perhaps the best we do in our day is that which is invisible to us. The person we smile at on the street, the parent juggling two toddlers and a supermarket cart full of food who we invite to go in front of us in line, the butterfly that is freed from the space between the window and the screen. And for some karmic reason, you get an email from someone with whom you worked just checking in to remind you that you’re missed, the kid at the drugstore gives you the biggest smile because you said “thank you sir” and he responds with “Thanks! This is the first time any one has ever called me ‘sir’ ma’am”…(would that I could have said, “Wow, that’s the first time anyone has called me ‘ma’am'”…). Silly, inconsequential moments all, I know…yet in total, also the magic of all things touching each other I guess. And if that is how we get through – by noticing the moments in between – in between the frustrations, the disappointments, the stress – then bring it on. I’m tellin’ you – that’s where it’s all happening. Posted on July 19, 2012 by mimijk •	This entry was posted in friendship, inspiration, life lessons, love, mindfulness. Bookmark the permalink. This post is you at your best, Mimi! The words ring so true, the examples just perfect. I am a BIG believer in karma, good juju, the power of little gestures, all of it, ’cause I’ve seen it at work in my own life time and again. That’s not to say that I don’t have some crappy a*#@ days, ’cause I do, and I oftentimes can’t get out of my own way….but as you so aptly point out, it’s all those other moments that lift us up. Wishing you a day filled with laughter and sunshine (mitigated by a cool breeze from the A/C, thank you very much) and the knowledge that your ‘virtual presence’ in my inbox each day is one of my biggest blessings…. Thanks Tina! Later today I am off to the petting zoo with a friend of mine and her 5 year old granddaughter. Can there be anything more delightful than looking at animals through a little child’s lens? I’m so happy you liked today’s thoughts and I hope you have a wonderful day – full of moments! Wow. What a story. Thank you for sharing. This is pure poetry and made my morning: Perhaps the best we do in our day is that which is invisible to us. The person we smile at on the street, the parent juggling two toddlers and a supermarket cart full of food who we invite to go in front of us in line, the butterfly that is freed from the space between the window and the screen. Well done once again!! You’re a good egg Mimi. Mimi: You made me smile again. Good karma all around. YAY! I’m two for two!! And, now, the tears are mine. Love you. Thank you so much Marie!! I hope all is well.. I love this “…if I didn’t take the opportunity to be kind, my heart would be assaulted with a severe case of the uglies..” I work every bleep-in’ day to keep myself on track with this, almost to the point of how I try to make good eating choices. You framed it perfectly. Trust me when I say I am not a church girl, but I kinda feel like I just went to church. The kind I would go to if I did. 🙂 . Oh, and the towel for the bunny? Priceless..just glad I had put my water down already. I have NO idea what I was thinking with the towel…another Mimi moment where I just shake my head in disbelief at myself! I loved your comments and appreciate them so much. I completely agree – it’s hard to keep this in one’s head all the time – and I’m sure no one does. But I do believe our hearts are malleable muscles – and the exercise of kindness can only expand and benefit its (and our) health. When I feel the uglies coming on I keep to myself – cause believe me it ain’t a pretty sight..
And I mean this sincerely when I say that I loved your post today as well. Hi my name is Mimi and I am a read-a-holic. There was so much wonderful eye candy for the reader, and recommendations for the summer – I was transported!! I needed this one today — been having some rough times. THANKS! Mimi thank you for the baby carrot of karma. Today more than ever our unwholesome actions can’t be hidden Watch any news story and soon you will see cell phone videos of the incident. Here in Vancouver over a year ago we had riots after the hockey season ended. What has caught most of the scoff laws, cell phone videos. So keep reminding us that seen or unseen, our good actions, do make a difference. Hey Keith – I think we need to remind each other. It’s true – we are assaulted with enough violent and negative images to make us worry for the future of humankind. And yet, my best days are the days when I’ve made someone smile, when I get lucky enough to save a bunny or talk with an elderly woman at Starbucks who spends hours there each morning just hoping for a human connection. It’s not earth-shattering, it will not change the world – but it does change my life for the better. Mimi every small act of compassion, love or understanding does change the world, even if only for the beings involved. 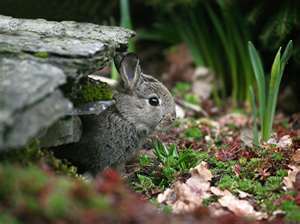 That little bunny is probably alive because of your actions, to him/her it may have been a life defining moment. Smiling at someone, or engaging in a conversation with a lonely person, who just needs human contact, these are all ways, we can all make a difference, however most don’t slow down long enough to notice the opportunity. So by sharing your story, you remind all of us, we can make a difference, one action at a time. Thank you Keith…thank you for making me feel special..
What beauty you create with words! I like the idea that perhaps the most important things we do are the invisible ones. Little niceties, a kind word, a smile. The things we do just because it seems like the right thing even if no one will ever know. I think these are the things that our true nature, our core selfs are made of. And can I tell you how happy I would have been if he had taken it with him?? Lol – it would have made me feel less silly for having put it out there for the little thing..I do think that our greatest kindnesses are those for which there’s no ulterior gain for us – just to do it because we’re here, and this is our only ticket for this ride. It’s easy for people to do the right thing if they think that there’s something they will get for their actions. It’s just as easy however, and more gratifying I think, when we just get into the habit of being our best selves without motive – just ’cause. Thank you so much for your wonderful comments – you made me feel happy all over!! Here’s the interesting question: Is goodness there because we are simply aware of it, or do we create it when it’s not obvious? On a less esoteric note, the bunny fell into the right pool. The space in between. The transitions. My very favorite yoga instructor/guru/friend always says that that is where there is most opportunity for growth. I wholeheartedly agree. 🙂 I hope your week ends as wonderfully as it began! Thanks, Mimi. It has been great so far. I think I’m in a good, good place. I LOVE this post! I agree with many others: one of my favorites! I love that you put a towel out…I believe kindnesses often call us to do that which seems foolish to others…we open ourselves to criticism and embarassment–which is proof we are being “other-centered”…thinking more about the other person…or creature. the power of these actions lies in the eyes of others observing…unnoticed by us. How else will children (and hopefully adults) learn? BRAVO! I can’t wait for another one! Happy Friday! I do know that our children learn far more from what we do rather than what we say…Have a wonderful day!! Mimi, I LOVE this post! I agree with many others: one of my favorites! I love that you put a towel out…I believe kindnesses often call us to do that which seems foolish to others…we open ourselves to criticism and embarassment–which is proof we are being “other-centered”…thinking more about the other person…or creature. I am proud to know you Mimi and prouder still to be considered friend. I absolutely love this post and the woman who thinks these thoughts. I am re-blogging it. The dispatcher responsible for placing drivers in the Karma Trucks sure knew what he was doing when he put you in the driver’s seat. Oh heck…I meant to say….Awesome New Word! And…didn’t your mother tell you never to argue with your elders? Hmmmmm? D’oh…well you got me there! ROFL. I will laud this over you mercilessly…ok, maybe not..
you can, but i can too. Gram ma! oooph…right in the gut…i wave the white flag you little whippersnapper you..
I’m not a grandma yet – well, I am now to you…and don’t you dare feel bad..I’m laughing! rofl…I did NOT mean it that way. Geesh, foot in mouth. I cannot say it enough…if you are NOT reading this woman on a daily basis, you are missing too much. It is my honor to share her heart on my page and I would wish all who visit me know the feeling of being hugged by Mimi. I send you abundant hugs – everyday…and when I finally meet you, I will deliver them in person!! I think the wine is as much of a given as the hugs! You are absolutely right. But in the rush and bustle of daily life (modern life perhaps more so), it’s a bit hard to be conscious. One gets too carried in flow and in my case at least inner monologues! k.
What a bloody great post……….. Thank you very much! I’m thrilled that you liked it! Thank you for sharing this touching story, Mimi! I love happy endings. And thank you for the excellent reminders in your post! Well done yet agin! Thank you Russ – it was yet another ‘teachable’ moment for me! I liked this post so much that I just read it a second time about 10 days later, Mimi. Very well done. Great message. I just noticed that I was the last to comment on this postother than you kind reply. Oh, well. You get a two-fer! ;-D! Lucky me!! I love your thoughts so I welcome any whenever they arrive!! 🙂 I hope you’re feeling better..